If at first you don`t succeed or don`t like what you see, cover it up!! 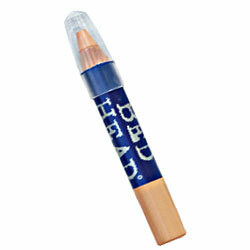 The TIGI Bed Head Wipe Out Biggie Fixx It Stick is a concealer and spot cover in one chunky stick. This ingenious TIGI Bed Head Wipe Out Biggie Fixx It Stick will cover up any imperfections and unwanted marks with a quick flick of this cleaver little pen.